In the old days (I’m talking Excel 5 to Excel 2003 here) there was a worrying situation you could find yourself in where, no matter what you did, Excel would show you “Calculate” in the statusbar. Even when actually nothing needed calculating. You could press F9, Ctrl/Alt/F9 or even Shift/Ctr/Alt/F9 until the cows came home, but you could not get rid of that pesky “Calculate”. Then along came Excel 2007 and solved the problem. Having just spent the best part of 2 days sorting out what looked like a problem with a lot of complicated VBA FastExcel code I have just discovered that its not a FastExcel problem at all: its an Excel 2103 SDI Bug (Single Document Interface – each window is separate from the others. As opposed to MDI -Multiple Document Interface where all the windows are within a parent window – as in all previous Excel versions). If you are using Automatic Calculation mode then the switch into and out of “Calculate” status does not happen. 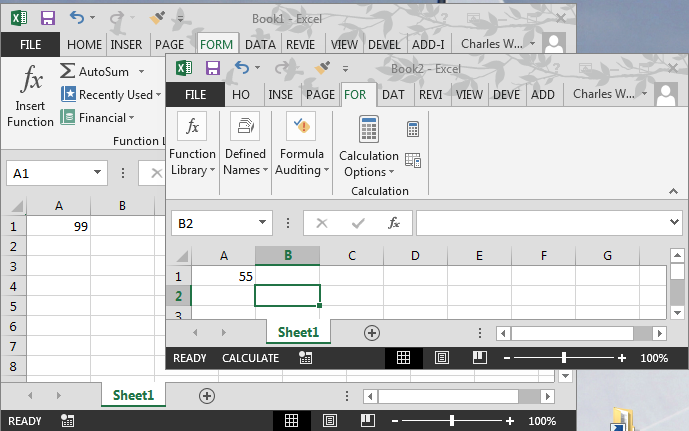 Start Excel 2013 with an empty workbook (Book1) and in automatic calculation mode. Now you can go back to the Book2 window and press F9 again, but that pesky “calculate” will NOT go away. If you change the formula in cell A1 (or do anything else that makes the workbook uncalculated) and then press F9 the “calculate” goes away! You can even make this happen in Automatic mode. Repeat the steps above, but when you have switched to Book1 with book2 showing calculate, instead of pressing F9 switch to Automatic calculation mode. Now switch back to Book2 and no matter what you do you cannot get rid of “Calculate” (except by going back to Manual, dirtying Book2 and recalculating). Moving Excel 2013 to SDI is the only way to get sensible support for multiple screens, and so was probably neccessary. I hope Microsoft can fix this Calculate problem in the forthcoming SP1 release before it bites too many people! This entry was posted in Calculation, VBA. Bookmark the permalink. – If a range of cells have been selected and you’re using “Conditional Formatting” your screen may hang! Select a single cell, scroll up and down with your mouse, and select a single cell again then wait a couple of seconds. This should bring excel back to life! Forgot a couple of other things to consider. – Recommend always setting calculation to “Manual” and un-check “Recalculate workbook before using” in the “File > Options > Formula > Calculate Options” section. This allows you to save at the very least due to Excel crashing. – Checking “Enable iterative calculation” in the above option section appears to have no effect to resolving the “CALCULATE” issue! Currently applying & testing conditional formatting posts. Regarding the “CALCULATE” drama, I have discovered that if you delete all data rows except for the first row (not my data headers which has meta-data information about the data rows). Then paste the first data row to the number of data rows desired (thousands). Full calculation (F-9 or shift Ctrl Alt F-9) CALCULATE disappears and the worksheet now says it is READY! I noticed in my case Application.Volatile is causing excel 2013 to calculate extremely slow if the workbook is on auto calculation mode. I have the weirdest problem in Excel 2013 which may, or may not, be related to this, but IMO it’s a bug. I’m writing a small unit test workbook which opens a template and writes data to it. The first line of code is, obviously, to set screenupdating to false and calculation to manual. When I want to retreive the value of a cell and use cell.calculate, this doesn’t result in the calculation of the value. Only after I finish the tests and set the calculation to automatic, does the cell reflect the expected value. The cell I’m checking is in a table (I don’t know if that matters) and the formula uses named ranges. If you use the camera tool, Calculate will always display on at least 2010 and 2013. I have 2 machines, both Brand new with Office 2013 on them, neither has ever had any previous versión on it. Hi, I have a VBA application running flawlessly in MS Excel 2010. After migrating to Excel 2013, I am facing many issues. The predominant issue is a run-time error while trying to open another workbook ( Book 2) through the parent workbook (Book 1). Book 2 contains macros, which was saved as .xls format. Could this be the cause? Book 2 macros are triggered through Book 1. I tried saving Book 2 as .xlsx and .xlsm format, but it did not solve the error. I am aware of the changes in Excel 2013 compared to Excel 2010. But I am not able to relate them to this problem. I had also read somewhere that there are specific tools that are required for changing Excel formats. I am not sure if such tools are required. Any suggestions? Whats the error message and whats the line of code that causes that causes the error? Hi, you just saved my day!